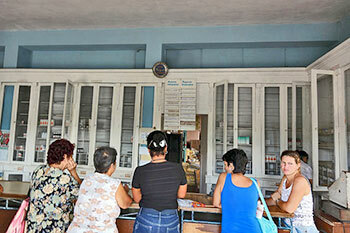 Cubans have named this town The Birthplace of the Constitution. 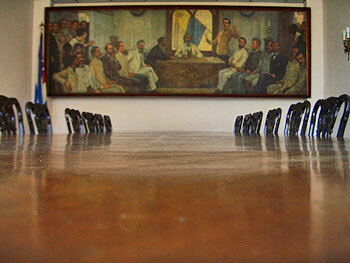 In fact, it was here that was written and made official the first Cuban Constitucion which specifies « se declaró iguales ante la Ley a todos los habitantes de la república ». 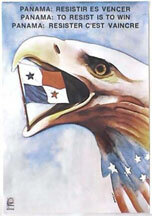 Demanding that "all be equal under the Law", the Ejército Libertador de Mambises completed in 1869 a document whose objective was the liberation of the Cuban people from the colony imposed by Spain. Thanks to the vision and idealism of Ignacio Agramonte, its main author, other such as Carlos Manuel de Céspedes, Salvador Cisneros Betancourt and Manuel de Quesada were able to assume leadership which would eventually reach the Royal Court in Madrid. 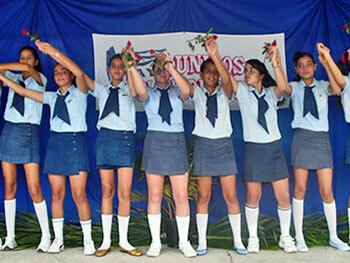 Adding her voice to the Cuban demands, Ana Betancourt insisted that womens' rights be the same as everybody else's. 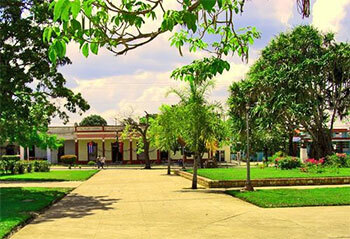 It was in Guaimaro's plaza pública on April 10 1869 that the announcement was made and this was the start of celebrations which lasted weeks here and elsewhere on the island. In the Monte Grande sector, most of the land is used for cattle grazing and crops. 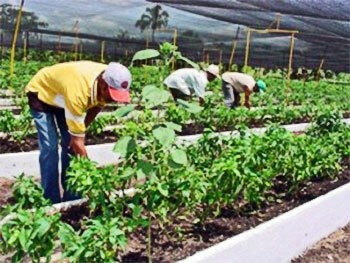 A large saddlery sellerie nearby and a stone quarry in Palo Seco are some of the important employers in this part of Camaguey province. 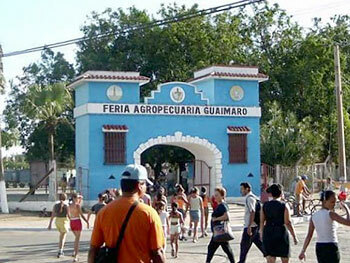 Every year, locals, camagueyanos and other Cuban vaqueros join guajiros from neighbouring towns such as Cascorro, Martí, Palo Seco, Pueblo Nuevo, San Miguel and Camalote to meet and compete in the great annual fair, the Feria Agropecuaria. 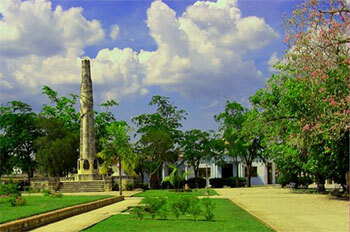 Guáimaro is the name of a local tree in the Taino aboriginal language. The local Taino population was wiped out by Spanish colonists in 1530. 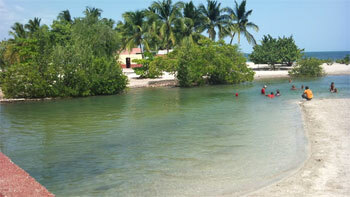 On the south coast, at some 60 km, the seaside town of Guayabal has a beach and a campismo. On the way there, stop in lovely Amancio  see below. • The large central park, Parque de la Constitucion with its 46-foot high Obelisco was inaugurated in May 1944 to honor the libertadores with bronze plaques of José Marti, Maximo Gomez, Carlos Manuel de Céspedes, Ignacio Agramonte, Calixto Garcia and Antonio Maceo. • Now located in what was first a school in 1925, the Museo Municipal General de la Constitucion relating the story of the ratification of the island's first constitution. every April since 1978 is held here the Semana de la Cultura en Guáimaro a week of cultural events to which take part some of these institutions : Sociedad del Teatro de Guáimaro, Galería de Artes de Guaimaro, Brigada de Instructores de Arte José Martí, Brigada artística Martha Machado, Museo Salvador Cisneros de Guáimaro, Casa de Cultura, Librería Municipal Ignacio Agramonte and the great cultural site of the town, built in 1918 and modernized in 1958 : the Cine Guáimaro. • In July, since 2008, the Festival del Audiovisual at Cine Guáimaro. • During the first week of October the unavoidable Feria Agropecuaria Guaimaro with horse races, rodeos, bull riding, lasso contests and everything to please the guajira and her cowboy (vaquero) • In November is the annual Salón de Mural, Artesanía y Cerámica Artística (murals, arts & crafts and ceramics) in the Guaimaro art gallery. Casa de Cultura Luz Palomares García  Theater, dance lessons, arts & crafts, music and an art gallery • Cine Guáimaro  movies, theater, shows and video room. BOOK BY EMAIL : Click on logo to open a message addressed to that casa in your email application; or right-click to copy address showing at bottom of browser window. Spanish vocabulary here. Google translate here.